Known affectionately as Megatron by NFL fans and his peers around the league Calvin Johnson has quickly established himself as perhaps one of the best receivers to ever play in the NFL. Although he has only been in the NFL for a few years and played much of that time with backup or journeyman quarterbacks Calvin Johnson has proven that he has both the physical ability and mental constitution to dominate at his position no matter who is throwing him the ball. Before the 2012 NFL season the Detroit Lions gave Calvin Johnson a seven year $132 million extension that made him not only the highest paid receiver in the NFL but also the highest paid player at any position in the NFL. Born and raised in the state of Georgia Calvin Johnson chose to state in state after high school to attend college at Georgia Tech. Although he was ranked as one of the top receiving prospects in the county coming out of high school and Georgia Tech didn’t have a wide receiver friendly offense Calvin endeared himself to fans all around Georgia by deciding to accept a scholarship that allowed him to play college ball in the state. In 2004, during his freshman season at Georgia Tech Calvin Johnson led the Yellow Jackets in receiving with 48 catches for 837 yards and 7 touchdowns while also being named to the All-ACC team. In his Sophomore season with the Yellow Jackets Calvin Johnson earned All-American honors while compiling 54 catches for 888 yards and six touchdowns. Johnson entered his Junior season with the Georgia Tech Yellow Jackets as a favorite to win the Heisman trophy for the 2006 season. Johnson broke out in 2006 with a stat line that would be at home in the NFL where players have 16 games instead of 13 to record stats. For 2006 Johnson compiled a gaudy 76 catches for 1,202 yards and his 15 touchdowns stood a a new single season Georgia Tech receiving record. 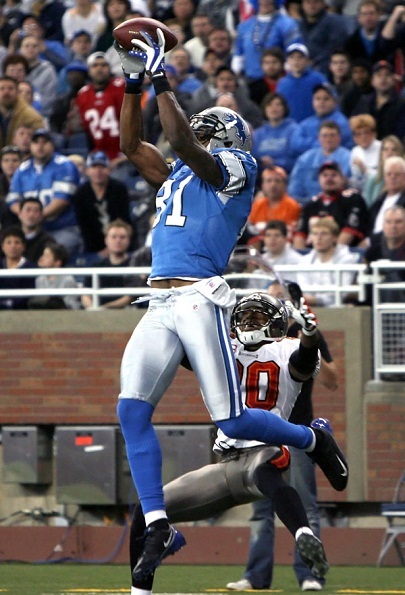 Although he did not win the Heisman in 2006 Calvin Johnson’s strong showing during his junior season established him as the best receiving prospect in the 2007 NFL draft and one of the top prospect overall. One of the reasons why NFL teams were so interested in Calvin Johnson is because he has a unique combination of size, speed, agility and natural talent that allowed to him dominate at his position. Generally, athletes with Johnson’s physical gifts may not have a strong work ethic or be able to overcome challenges on the field because they are used to relying on their physical ability to help them get by but Calvin Johnson proved to be an exception to the rule. He possesses all of the natural physical ability that an athlete can ask for but at the same time he works harder and studies the game more than a blue chip player that is used to working for everything that they have. Of course a player with these sort of features and characteristics is considered to be a once in a lifetime opportunity and that is why the quarterback deficient Detroit Lions selected Calvin Johnson with the second overall pick in the 2007 NFL draft. The only other player selected ahead of Calvin Johnson, who was widely considered to be the best athlete in the draft, was LSU quarterback Jamarcus Russel who wound up being one of the worst busts in NFL history. In his rookie year with the Detroit Lions Calvin Johnson caught 48 passes from journeyman quarterback Jon Kitna for a total of 746 yards and 4 touchdowns. With the Detroit Lions young wide receiver looking to be everything advertised and more and Jon Kitna coming off of one of the best seasons of his career Lions fans had high hopes for the 2008 season. Unfortunately, that is the season that the Lions decided to go winless despite a Pro Bowl performance from Calvin Johnson. The one good thing to come out of the 0-16 season is that it convinced the Lions to draft a quarterback in Matthew Stafford from Georgia to throw to their new stud receiver. Stafford struggled with injuries during the first two years of his career but he finally put an entire year together in 2011 and he and Calvin Johnson would pair to form one of the most feared passing tandems in the league.